Over the weekend, I had a chance to finish up a project that I started (and immediately became distracted from) several weeks ago. Best of all, Paul has a Lego city on display. We had been looking for an interesting way to add light to the city, so when I saw some RGB LED light strips for sale at Ikea, I knew I had to mod them. In their stock configuration, these light strips can do boring fully-saturated colors, and you switch between them with a boring push-button switch. 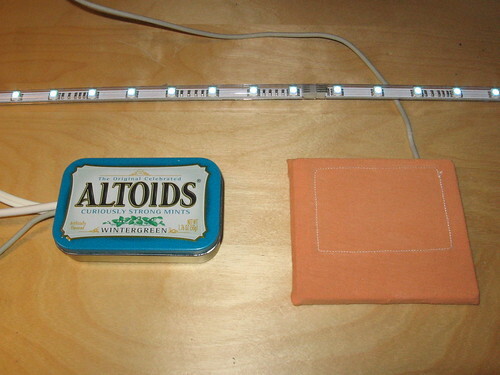 The Altoids tin has the modified driver circuit: It’s the original circuit board with the microcontroller removed, then a homemade Arduino clone to control it. The orange box is an old Cirque PS/2 touchpad, removed from its original case and covered in fabric. The Arduino sketch (firmware) is a little C++ program that reads the touchpad and uses it to control Hue and Lightness in the HSL color space. The result is a pretty intuitive and unobtrusive control which makes it easy to both pick a color and desaturate it toward white or dim it toward black. You can easily get some really nice sunset and sky colors. I measured the power consumption of the completed light at between 1 and 6 watts. 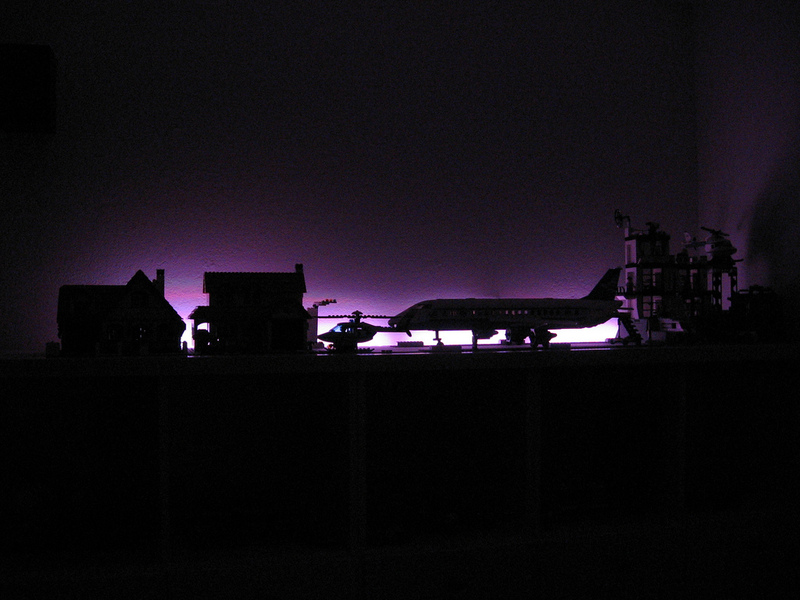 With Bay Area electric rates, this means you’d pay about 7 cents a month to leave it plugged in with the lights fully off, twice that to constantly backlight your Lego city in a dim orange glow, and a maximum of 50 cents a month to run the light at full brightness continuously. For many more pictures of the final installation and the build process, check out my Ikea DIODER set on Flickr. This entry was posted in LED Lighting and tagged arduino, avr, ikea, led, lego, microcontroller, mini-project, touchpad, user-interfaces on December 1, 2008 by Micah.